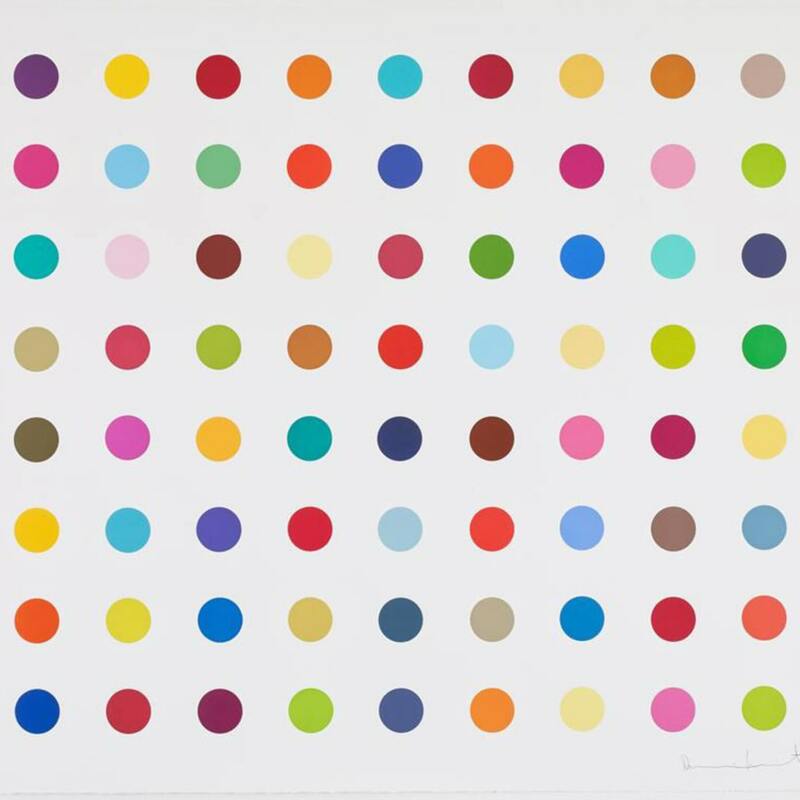 Damien Hirst was born in 1965 in Bristol and grew up in Leeds. In 1984 he moved to London, where he worked in construction before studying for a B.A. in Fine Art at Goldsmiths College from 1986 to 1989. He was awarded the Turner Prize in 1995. At Goldsmiths, Hirst’s understanding of the distinction between painting and sculpture changed significantly, and he began work on some of his most important series. The Medicine Cabinets created in his second year combined the aesthetics of minimalism with Hirst’s observation that “science is the new religion for many people. It’s as simple and as complicated as that really.” This is one of his most enduring themes, and was most powerfully manifested in the installation work, Pharmacy in 1992. In his second year at Goldsmiths, Hirst conceived and curated Freeze, a group exhibition in three phases. The exhibition of Goldsmiths students is commonly acknowledged to have been the launching point not only for Hirst, but for a generation of British artists. For its final phase he painted two series of colored spots on the warehouse walls. Hirst describes the spot paintings as a means of “pinning down the joy of color,” and explains they provided a solution to all problems he’d previously had with color. It has become one of the artist’s most prolific and recognizable series, and in January 2012 the works were exhibited in a show of unprecedented scale across 11 Gagosian Gallery locations worldwide. Since his involvement in Freeze in 1988, curatorial projects have remained important to the artist. In 1994 he organized the international group exhibition Some Went Mad, Some Ran Away at the Serpentine Gallery. Over a decade later, explaining that he considers collections to constitute a “map of a man’s life”, he curated an award-winning exhibition of work from his Murderme collection: In the Darkest Hour There May Be Light at the Serpentine Gallery. Stating: “I am absolutely not interested in tying things down,” Hirst has continued over the last decade to explore the “big issues” of “death, life, religion, beauty, science.” In 2007, he unveiled the spectacular For the Love of God, a platinum cast of a skull set with 8,601 flawless pavé-set diamonds, at the White Cube exhibition Beyond Belief. The following year, he took the unprecedented step of bypassing gallery involvement in selling 244 new works at Sotheby’s auction house in London. Describing the sale as a means of democratizing the art market, the Beautiful Inside My Head Forever auction followed Hirst’s Sotheby’s event in 2004, in which the entire contents of the artist’s restaurant venture, Pharmacy, were sold. Since 1987, over 80 solo Damien Hirst exhibitions have taken place worldwide and his work has been included in over 250 group shows. Hirst’s first major retrospective, The Agony and the Ectasy, was held in the Museo Archeologico Nazionale in Naples in 2004. His contribution to British art over the last two and a half decades was recognized in a major retrospective of his work staged at Tate Modern in 2012.